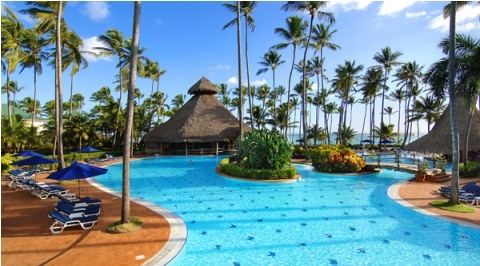 Barcelo Bavaro Palace is one of the Best Resorts in Bavaro Beach. and a section of high end suites – Club Premium, Panoramic, Master, and Presidential also located right on the beach. The complex is located on Bavaro Beach, Punta Cana. The turquoise water is shallow because of the coral reef that sits a few yards from the shore. That makes this beach one of the best in the world. 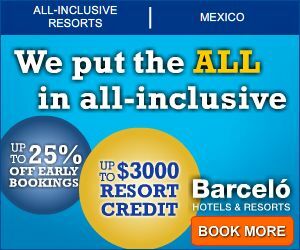 Punta Cana Resorts are known for their all inclusive packages. 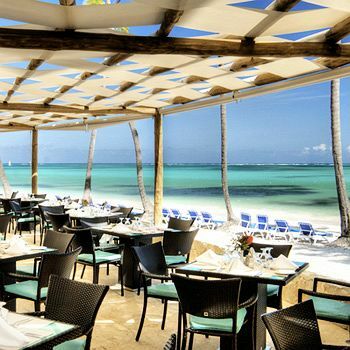 If you stay in the Barcelo Bavaro Beach Resort you will enjoy unlimited access to restaurants, bars and discos. offered in all of Punta Cana Resorts! Deluxe Room: Single level rooms with premium quality furnishings. All rooms have golf course views. Two double beds or one king size bed. 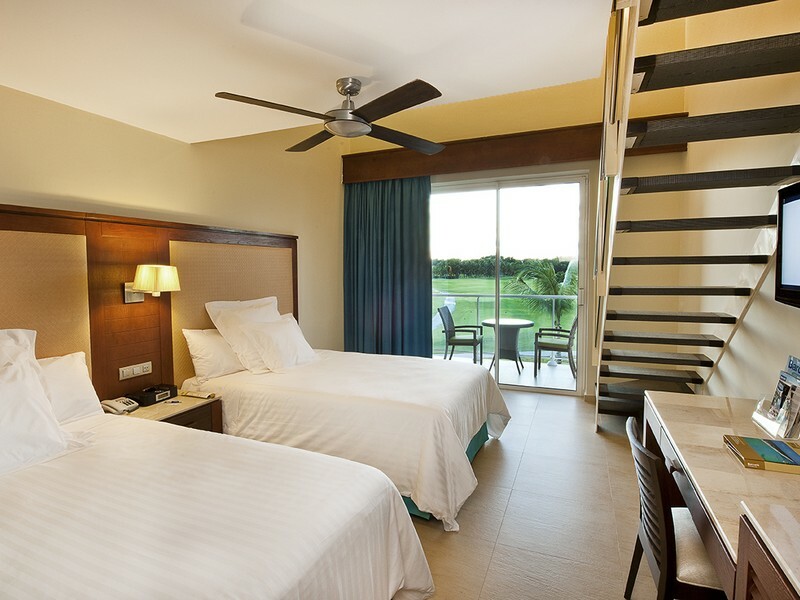 Family Deluxe Room: Family deluxe rooms with two separate bedrooms overlooking the garden of the golf course. Family Duplex: Two level rooms, loft style, that accommodate up to 4 people, max 3 adults. Two full bathrooms. Junior Suite Deluxe: Two double beds and one or two sofa beds. One full bathroom. Partial views of the ocean and/or gardens. Junior Suite Deluxe Ocean Front Club Premium:These rooms are right on the beach! They accommodate up to 4 people, max 3 adults. One full bathroom. Family Junior Suites: These rooms are quite large and can accommodate 4 to 6 people, max 4 adults. Views of the ocean and/or garden. Two fully equipped bathrooms. Master Suite Ocean Front Club Premium: These rooms can accommodate 2 adults. In this room you can enjoy all the benefits of the Club Premium service. Spectacular suites with ocean views. Two full bathrooms. Grand Master Suite Ocean Front Club Premium: Over 2,000 square feet to enjoy the amazing ocean views in this grand suite that features a bedroom, living room and dining room. Also available are all the benefits of the Club Premium. Max occupancy 2 adults. Two full bathrooms and two jacuzzis. 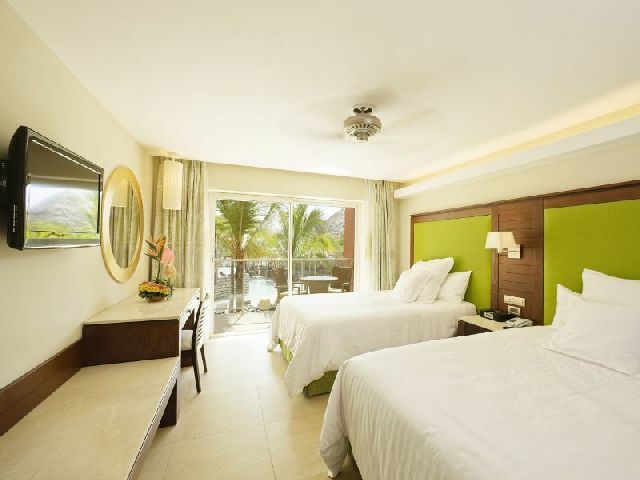 Presidential Suite Ocean Front Club Premium: This is the largest room in the Barcelo Bavaro Palace Deluxe. These rooms have stunning ocean views and all the luxury you can imagine. It consists of 3 bedrooms and 3 bathrooms and even exclusive butler service. It accommodates up to 6 people. There are ten great all-inclusive restaurants to choose from. You will enjoy great food from different parts of the world. A charming French restaurant drawing inspiration from the late-eighteenth-century puppet theaters in Lyon. You can try the romantic flavors of French cuisine and choose your wine from a long list. Dress code: Casual elegant. Dining hours: 6:30 - 11pm. The atmosphere resembles that of The Academy Awards ceremony: red carpet, lights and posters of all-time movies for a fabulous Italian restaurant. The best Spanish food in the world. Meat or fish with delicious vegetables to choose from a large and varied menu. The bar offers a fresher ambiance, delicious tapas, and an impressive wine selection. The best contemporary Asian fusion cuisine. 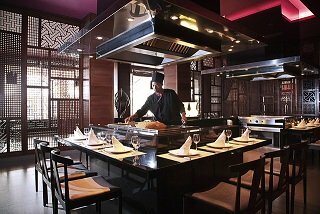 You can dine with your partner or friends at amazing teppanyaki tables for groups. Kyoto features an innovative contemporary decor and has a wonderful Zen garden at the entrance. Surrender to the exquisite flavors of typical Mexican dishes. Original recipes from every region in the country. unrestricted access to all its restaurants! Home | About Me | Contact Me | What's New!